This bike was built by a guy called Niklas Wall from Skokloster in Sweden and, to be really honest, he’s not really a biker. No, while he’s very definitely into customising in a big way, he’s more into custom cars, hot rods and low-riders than bikes; some years ago he built a famous radical custom out of a 1955 Dodge with a roof chop and a lot of other custom tricks too, and right now he’s modifying a 1957 Ford station wagon that’ll also be a cool custom when it’s done. The reason he started this two-wheeler project is more or less down to his workmates – during every lunch break on the job several of his friends’d always talk about the bikes they’d either built or were working on at the moment, and most of them were choppers. This went on and on and, after some time, even Niklas got hooked on the idea of building a bike and he started looking around for a project. 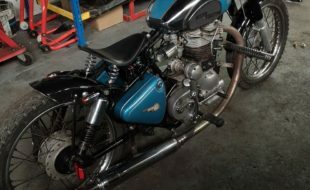 It didn’t take long for the right bike to turn up; a Triumph 650cc Bonneville from 1970 that the owner’d started to work on, but then lost interest. The frame’d been modified and painted, but the engine was still in a large number of parts, but this wasn’t too much of a problem for him as he’d trained as a mechanic and was used to working with engines. 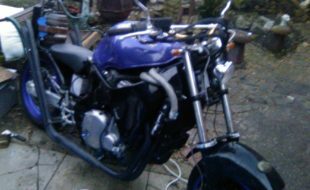 Thankfully, nearly all the parts he needed to rebuild it came with the bike, and as the price was less than £1,500 he decided to go for it. Putting a small blower on to the engine sounded like a cool idea, but it turned out to be so much more work than he thought it’d be. Firstly he had to modify the ‘charger so that it’d take a chain that’d link it with the engine – something that wasn’t easy. 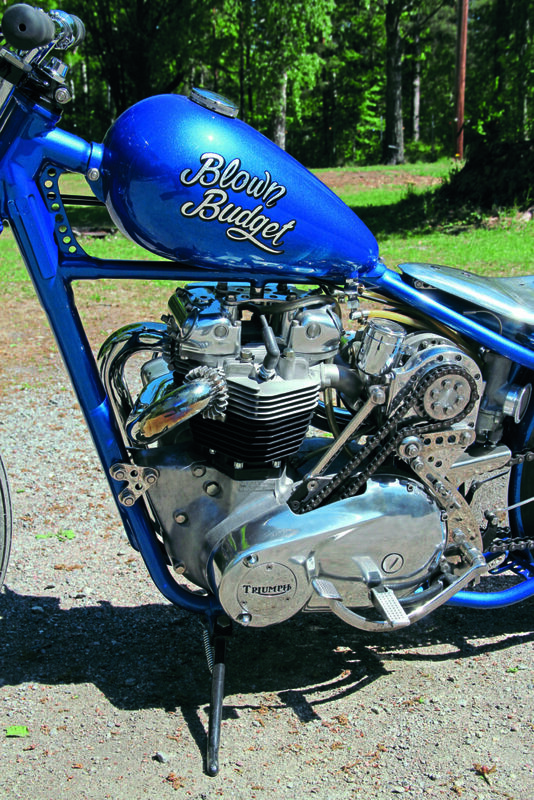 Then he had to modify the engine to take the chain to run the supercharger, reworking the crank and the primary case to get it all running true, but that wasn’t the end of it – in fact, he soon found that, to get the blower in where he wanted and all lined up, he’d need to modify the frame too, and he ended up redoing just about the whole bike one way or another. 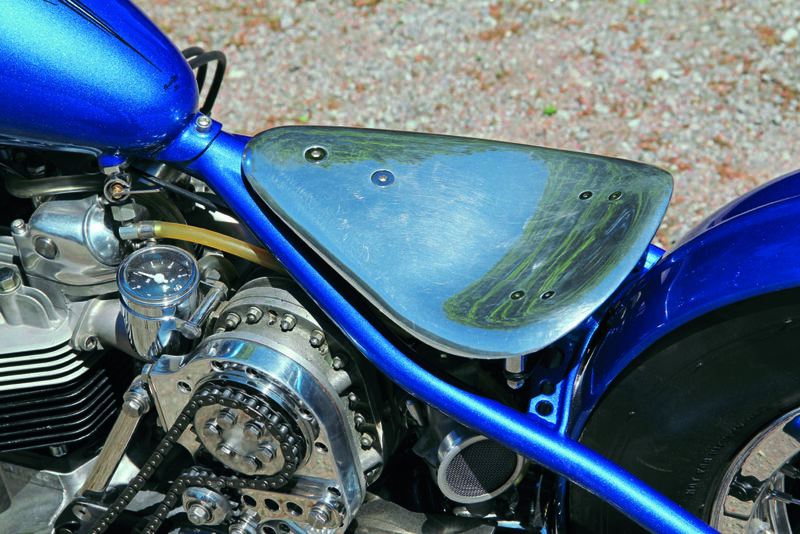 The original oil tank, for example, was too big to fit in with the ‘charger and the carbs so a new, smaller one had to be made (it’s actually one of the few parts that was chromed on this project – a lot of the smaller parts’ve been made from stainless steel and/or alloy, and all of them have been polished to get a great shine on the bike even though there’s not much chrome). The engine needed looking at too; since the supercharger gives the engine more horsepower, he’s had to put in stronger con-rods, and install stronger valve springs too, and the Amal carbs were also modified to force in more fuel. As bigger is always better, especially when you’re going forced-induction, a 750cc Morgo big bore kit was fitted to replace the old 650cc cylinders, and the ignition was uprated to give bigger and better sparks at the plugs by the fitting of a reassuringly expensive Joe Hunt magneto. Now that the Triumph had a supercharger it seemed natural to him to give the bike a bit of a race look. 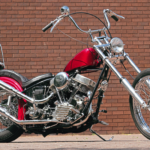 The original forks were shortened by two inches, and shaved of all the brackets that weren’t needed, and the front wheel changed to a 21 inch, but it still uses the original drum brake with a polished side cover. The rear’s an 18-incher with the stock Triumph brake. The home-made drag-style ‘bars add to the race look, while the home-made long, stacked exhaust pipes aren’t even remotely ‘race’, but they definitely give the bike personality. 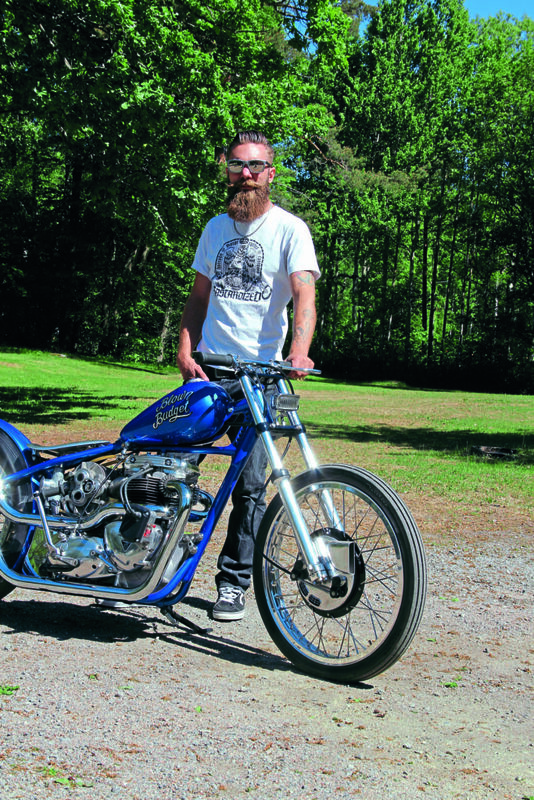 The tank was born to sit on a Harley-Davidson Fat Boy, but it’s difficult to tell that now – Niklas cut the tank into nine separate parts, and threw away a lot of metal before he welded it together again. The result is rather good, don’t you think? A new rear mudguard was also needed; a friend had a ’39 Buick spare wheel cover that was the perfect item to start recrafting into a suitable ‘guard. 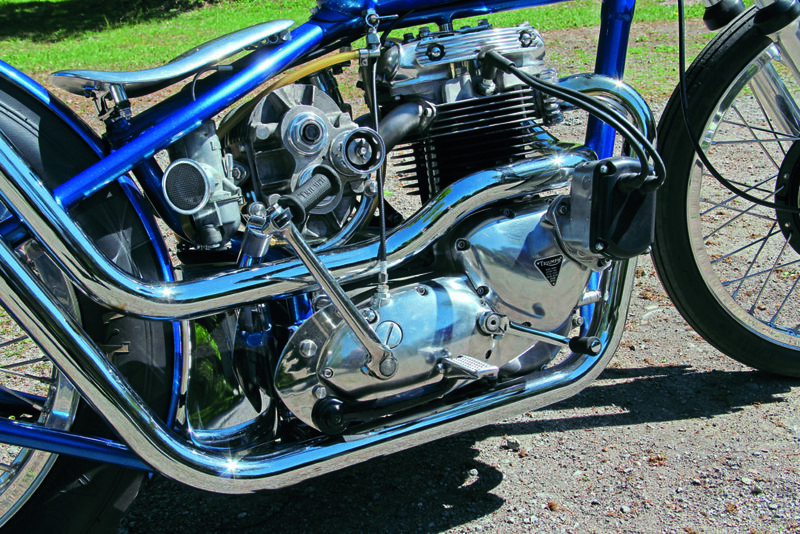 He also made the small seat out of aluminium parts, and polished it until it had the right shine – it’s not the most comfortable seat, he admits, but it sure has the right look for a bike like this. When everything was constructed, he prepared the bike for paint, and then a friend took over and sprayed it in a deep blue colour. A bike like this needs to have a name, and he soon named it ‘Blown Budget’ although, to be honest, the name’s not really that true – yes, he has spent a fair amount on getting everything just so, but it could’ve been if Niklas hadn’t been able to do most of the work himself. 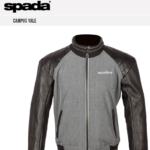 Now that it’s complete, it’s had a lot of attention at bike shows all across Sweden, and that’s fired him up. He’s now planning a new project… well, when his ’57 Ford’s done anyway. One thing at a time’s his way of doing things, and that’s been proven to work out for him just fine. 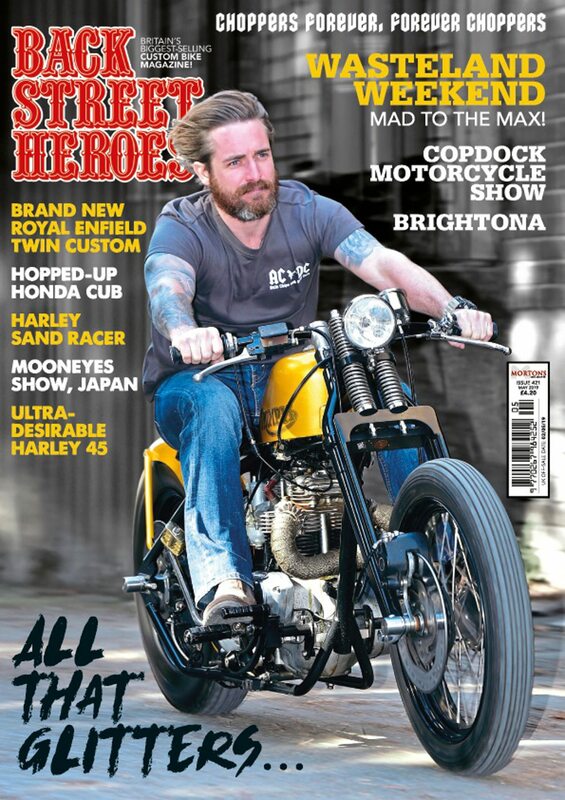 Previous Post:Get your fix of custom bikes with our November issue!